When I first heard that Horizons was closing, I immediately felt a sense of loss. Where would I dine during my travels to Philadelphia? Soon enough, that question would be answered as the owners (and chefs), Richard Landau and Kate Jacoby, had closed Horizons purposefully with the plan to open a high-end vegan restaurant in a different part of town. But, would the food be as good as Horizons? I must say I lost sleep over this question for quite a long time. 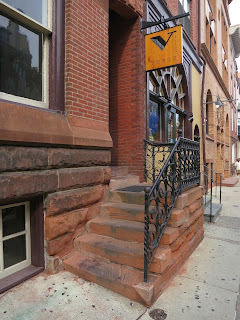 So nearly a year after its opening, Zach and I, along with a few local Philly friends, headed up for what would soon be one of the best vegan meals I'd ever had. Vedge is located downtown near several theaters so it seems they are attracting a bit of a varied clientele -- vegans searching them out as well as people attending the theater who are seeking a different pre-theater experience with upscale, healthy options. As reservations are hard to come by, by the time I called, I could only get reservations for a 5 p.m. slot so we essentially opened the restaurant. 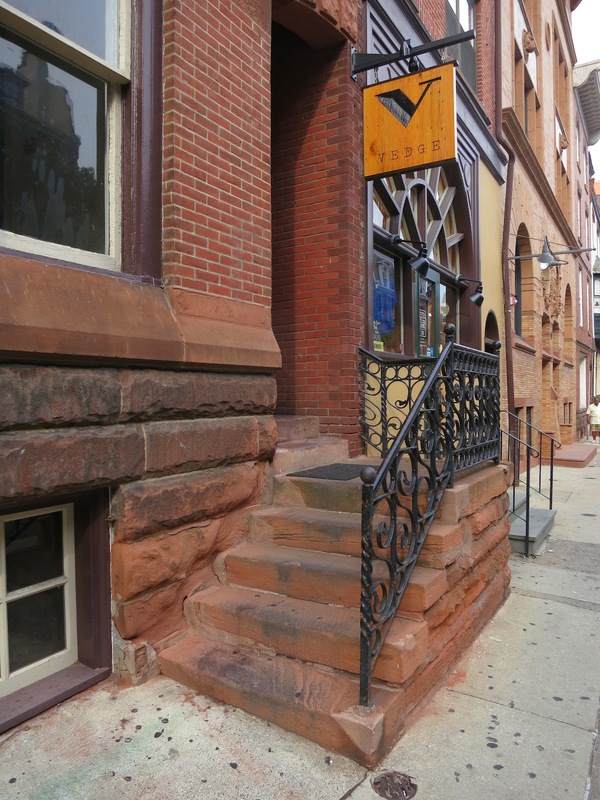 From the outside, Vedge looks like a converted townhouse with its red brick facade and a staircase with a black wrought iron railing. Inside, however, it was clear, that it had been completely remodeled. Upon entering, we were greeted by the host who stands next to a beautiful white granite bar. They led us to our table through one room and into another where I immediately remarked about how nice it was that they had an open prep station. The hardwood floors and elegant tables and chairs along with the impeccably dressed servers created an upscale ambiance that didn't exist in the former Horizons. We first took a look at the wine menu, which boasted fine wines of all categories -- white, red, rose, and sparkling. Unfortunately, not many are served by the glass so our options were limited. We inquired as to whether the wines were vegan or not and I was surprised to hear the server state that they do not make any claims about the wines. He said it is too difficult to determine which wines are vegan and that that can change over time so they will not say that their wines are vegan. This was surprising to hear at a vegan restaurant, I must say. Regardless, I started with the Bordeaux, Domaine Guitto Fellonneau from Bordeaux, France (2005), which was a nice light red that went well with all dishes. We kind of chuckled when our waiter described the notes as "leather" as I wouldn't expect to hear that in a vegan restaurant. I asked if perhaps he meant "pleather," and he laughed as well. We all found the menu layout to be very confusing. At first glance, it appears that the appetizers are $5, and the entrees range from $8 to $15 when in fact, the canapes are $5, and the appetizers and smaller plates are half the menu and range from $8 to $10 while the entrees are the second half of the menu ranging from $13 to $15. The dirt list, which is separate shows the vegetable specials for the month and ranges from $6 to $9 a plate. After explaining all of that, the server recommended that we each order 3 to 5 plates -- at least one from the dirt list, one from the small plates, and one from the large plates. Woah. That just sounded like a lot of food. We decided to be conservative and start with three plates of food each. Once we placed our orders, they brought out some incredibly fresh soft bread served with olive oil that had a mixture of parsley and garlic in the middle. My first plate was off the Dirt List and consisted of delicately sliced nebrodini mushrooms cut to resemble thin strips of fazzoletti pasta served in a light wine wine sauce with oven roasted tomatoes and basil. It was like love at first bite. Zach had the crispy cauliflower, which gets a 10 for presentation. The cauliflower was cooked in a creamy sriracha sauce with lemongrass and peanuts. It had a very nice kick to it. Zach remarked that the cauliflower dish we love so much at Zaytinya was better than this one. I can't disagree with that, but they are completely different dishes. My friends ordered the yellow zucchini gratin with smoked paprika glaze and pistachios along with the fingerling potatoes. So far, everything was great. For the second course, I had one of the small plates. I was incredibly impressed by the presentation and even more so by the complexity of the flavors. This dish was molded and served as many layers stacked high consisting of salt roasted golden beets, avocado, smoked tofu, and capers. It was topped with toasted rye, which I used as a base for all of the flavors. There was also a frothy light cucumber sauce that paired well with the dish. If I had to use two words to describe this dish they would be complex and beautiful. Zach had the wood roasted purple carrots served with a white bean sauerkraut puree. I thought the carrots were roasted perfectly and the puree was a great complement. Zach did not like that the carrots were roasted, then chilled so when they were served they were cold. Other than that, it was delightful. For our main courses, all four of us ordered the exact same thing! So much for trying everything. We all wanted the seitan dish as meat analogues are scarce on this menu and we were curious to see how this one would taste. Plus, seitan dishes at Horizons were always amazing so we were sure this would be a good choice. And it was! The seitan was grilled to a perfect crisp and placed atop black lentils and topped with grilled leeks and smoked romesco. This was a perfect marrying of flavors as the warm crispy seitan soaked up the chilled black lentil flavor while the leeks and romesco served to complement the dish. We all loved it. For dessert, I chose the blueberry fritters because at this point it was clear that the calories no longer mattered. These little fried balls of dough were served with blueberry lemon sorbet atop a mango crudo. It was delightful. My friend got the cheesecake with Black Mission figs, white port reduction, and pistachios. It was very good. When we inquired as to how it was made, we were told the recipes are kept quite close to the chef. All the server knew was that it was soy-based. Hmmm. I must mention though that our server, Matt, was incredibly professional and sophisticated. He took great care of our table. Having to order so many plates made for slightly pricey dinner. There were four of us in our party and we each ordered about two drinks and four plates including dessert. The final bill with tax and gratuity was about $300. All things considered, that really wasn't that bad. 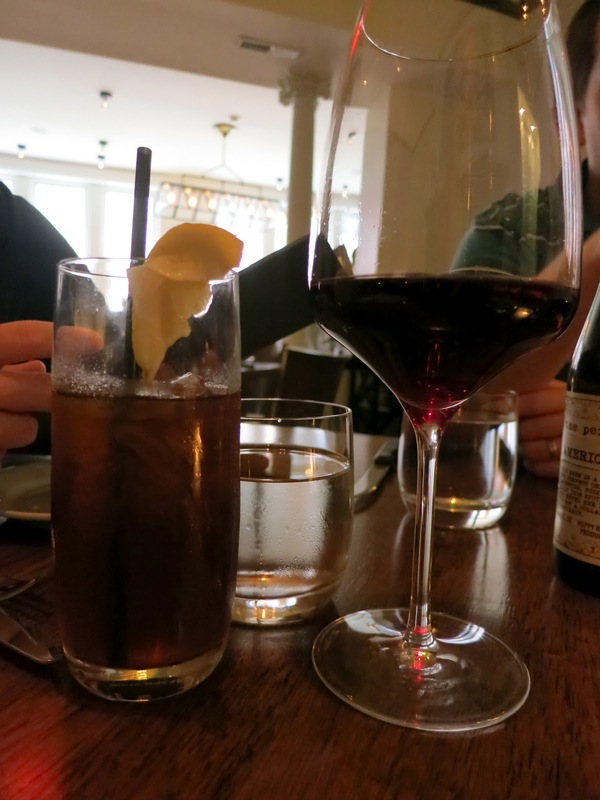 It would cost us that much to have three courses in DC without drinks! So, all in all, I was extremely impressed with this restaurant -- from the romantic ambiance to the exquisite food and everything in between, I'd rank this restaurant up there with the likes of Millennium and Candle 79. What a great addition to Philly--the city of veganly love.